Postcard US-2262748 to Portugal shows the Longevity Hill at the Summer Palace in Beijing, China. 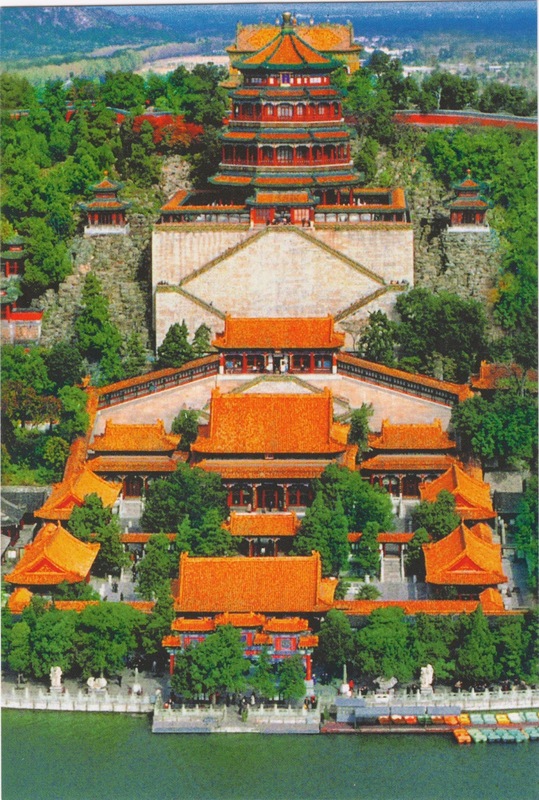 The front hill, as shown on the postcard, is rich with many splendid halls and pavilions. The Summer Palace, once an imperial garden in Qing Dynasty, has now been one of the UNESCO's World Heritage Sites since 1998. First Lady Michelle Obama visited the Summer Palace in Beijing on Saturday, March 22, 2014, second day during her week-long trip to China. Mrs. Obama was accompanied by her daughters and her mother, and a group of visiting students from the U.S. They enjoyed a Chinese opera performance and took a boat ride on the famous Kunming Lake. The week-long trip, with the focus on the importance of education, from March 19 to 26 includes stops in Beijing from March 20 to 23, Xi’an on March 24, and Chengdu from March 25 to 26.